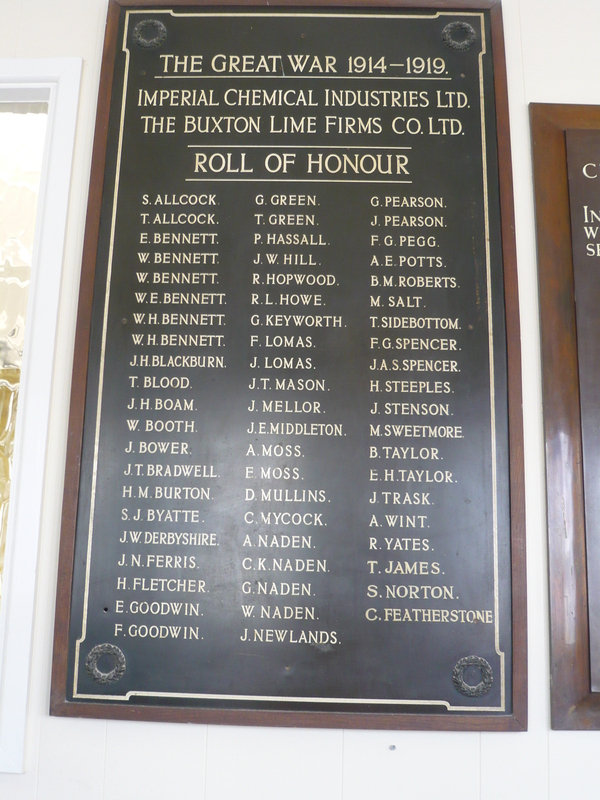 Pte Douglas Mullins worked for Buxton Lime Firms and is also remembered on their Roll of Honour. 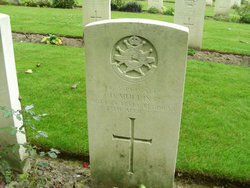 Douglas Mullins was born A/M/J Qtr 1893 to Martin and Emma Mullins. In 1901 the family were living at 12 Cross Street, Fairfield. Douglas was the youngest of 4 Children having 2 older brothers Ernest, Joe and an older sister Bertha. He was at North Road School in 1901. By 1911 Douglas was living at Upper End, Peak Dale and was a labourer at the nearby Quarry. 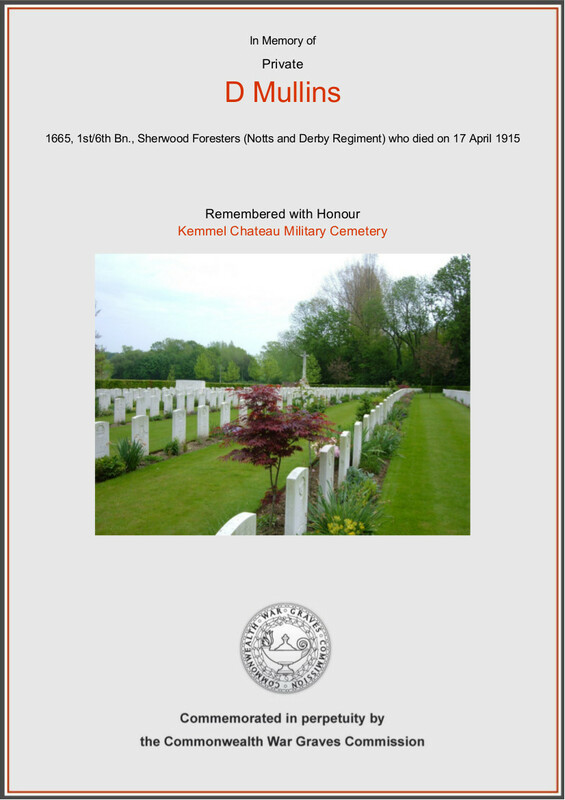 Douglas enlisted into the 6th North & Derbyshire Regiment (Sherwood Foresters) Pte 1665 on the 17th April 1912 he was just over 18yrs old. A year later he married Jane Tattersall in A/M/J Qtr 1913. Pte Douglas Mullins died on 17th April 1915, 3yrs to the day since he enlisted. Congratulations to Lieut Dennis R Mullan, who has been Gazetted to the 6th Sherwood Foresters. He was nominated to this regiment last Autumn. 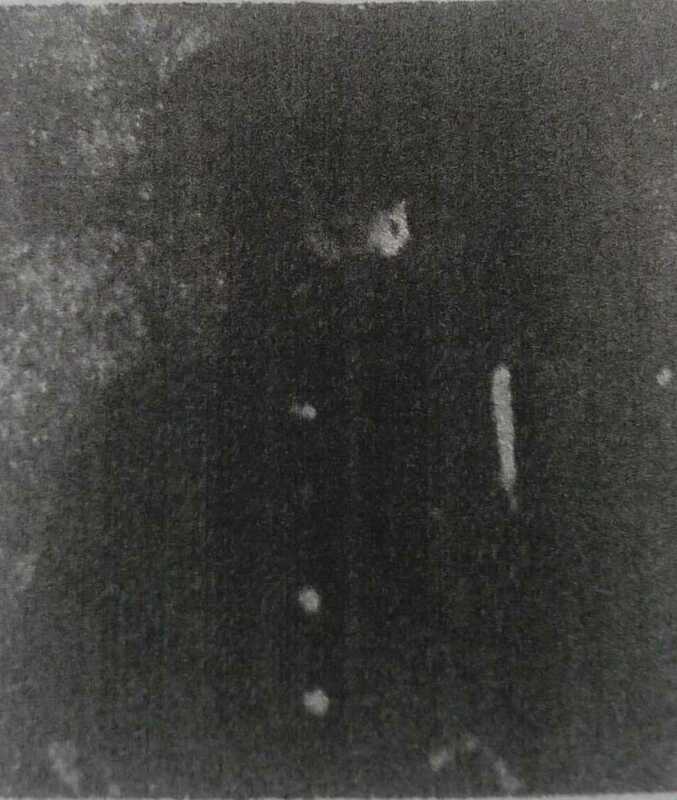 The photograph shows him in the uniform of The Artists’ Rifles O.T.C, in which after training for 7 months he successfully passed his final course in the Officer Cadet Unit attached to that Corps. 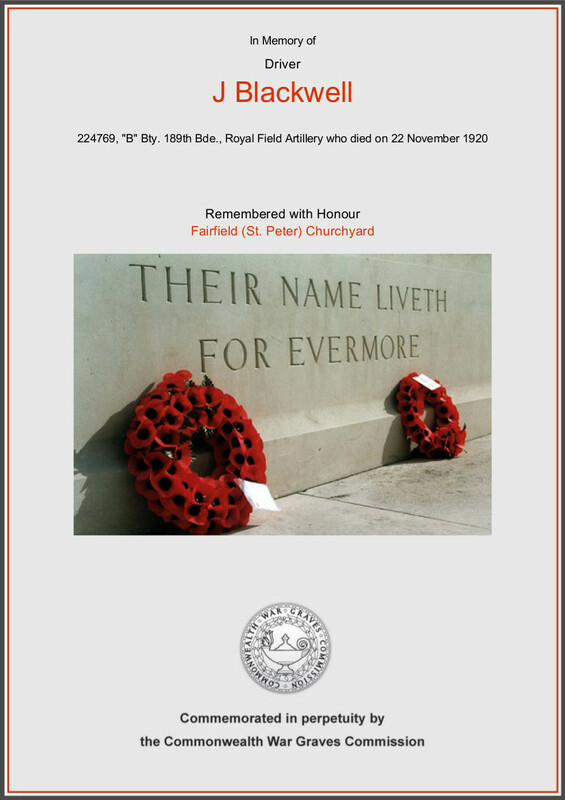 Born in 1894 he is the eldest son of Mr T F Mullan, of Londonderry. and nephew of the Misses Nicholson of Clifton Bank, Fairfield, and also of the late Major Nicholson of Beech Hill, Londonderry. He was educated by the Rev. C Denman Canterbury, Army and Navy Coach, of Farley, North Staffs. For the last few days he has been on leave pending Gazette, and his numerous friends were pleased to him amongst them again. He has been the recipient of many congratulations upon his promotion from friends in the Fairfield and Buxton District. He joined his regiment on Monday and the best wishes for good luck went with him. Dennis was born in J/F/M Qtr 1895 in Londonderry, in 1901 Dennis aged 6yrs was living with his Aunt Louisa Nicholson along with brother Maurice boarding with Mr & Mrs Hodkinson in Fairfield. 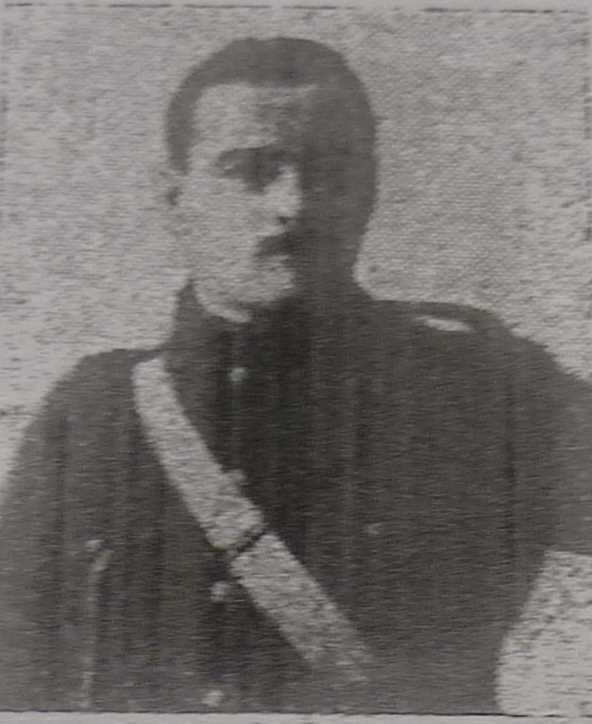 Joseph served with the Royal Field Artillery, ‘B’ Battery, 189th Brigade. The service papers for Joseph have not survived. 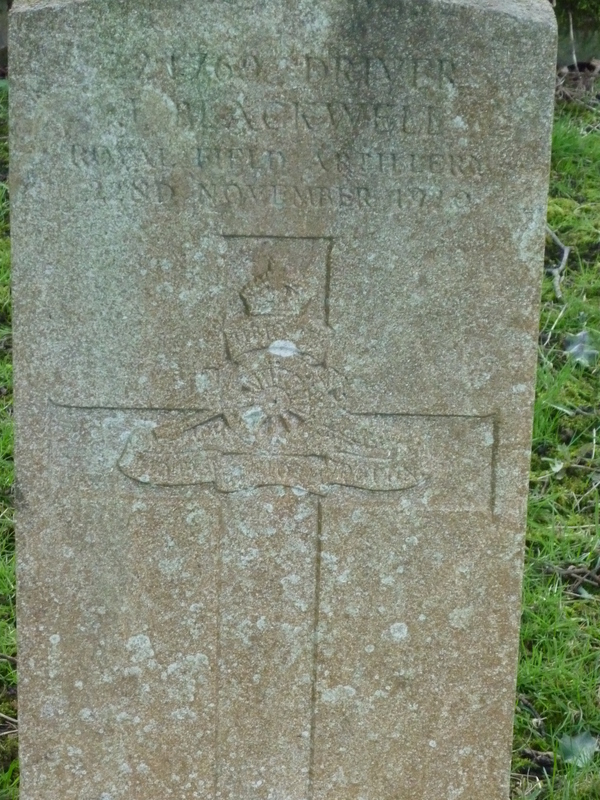 Joseph was the uncle of John Blackwell and George Blackwell both deceased in the War. Joseph was born in the O/N/D qtr Vol 7b page 767 1881 in Buxton, the son of William & Fanny Blackwell. In 1891 Joseph was living on Fairfield Road with his parents William & Fanny (Hough) Blackwell, the family were Cab Proprietors. Joseph had 3 older brothers John, Frank & William an older sister Fanny and 2 younger siblings James and a sister Corvetter? Joseph started North Road School on the 1st February 1892, his birth is given as 3rd October 1882 not the correct 1881, he left school on 8th January 1896. 1901 Census: Joseph was living with his widowed mother and brother James off Spring Gardens Buxton working in their Stables. His father William was deceased. 1911 Census: Joseph is now married to Eliza Ann Thompson, the couple married on 16th April 1906 at St James Church. The couple had a son Norman Edward aged 3yrs, Joseph is a Cellar man for a Wine Merchant and the family are living at 16 Dale Road, Buxton. Joseph died at home in the O/N/D Qtr Volume 7b, page 814, and is buried at St Peters, Fairfield. Pte. John Payne Goodwin of 2, Queens Road, has been home from Saturday to Monday, and his friends were glad to see him in their midst. He is now stationed in this country at an important recruiting office, where he is engaged in clerical work. John was born on 11th November 1896 to Joseph & Mary (Payne) Goodwin, the 1911 Census shows the family living at 2 Queens Road, John is at school. Looking through the records it would appear that following John’s return from the War he took Holy Orders. He took the name Ignatius as a further middle name. Reverend John Ignatius Payne Goodwin died on 10th August 1965 and his death was registered in Bakewell. The following year his probate was heard, John left £1633 to the Order, a substantial sum of money.